The [Ei] platform is a paradigm shift in how intelligent public spaces interact with people. [Ei] is a series of solutions that enables you to build an adaptive and intelligent environment using objects people already see and interact with every day. Transform your walls, floors, and furnishings into a smart ecosystem that measures human behavior and reacts to it in real time. Your environment becomes a living hub for customers, an educational portal for employees, a window into business analytics, and a digital playground for everyone. Custom-built and scalable, the [Ei] platform empowers you to grow your organization to unprecedented heights. The foundation of the [Ei] Platform is the operating system, [Ei] OS™. Choose your level of interaction from the following flavours of software. Digital communication unlike any other. Schedule unique content by region, to play in single or multi-screen environments. 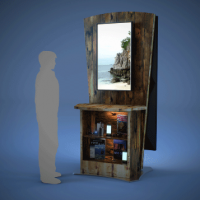 Create interactive kiosks, using content brought to life with your brand. Track human behavior in public spaces. A fully intelligent environment. 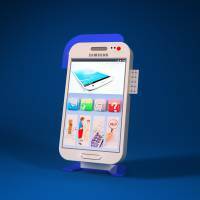 Objects recognize individuals, deliver personalized information, and glean contextual insights from human behavior. Collect environmental and behavioral data from a diverse variety of sensors. Manage employee tablets from one base, whether they’re in the field or office. Connect people with training materials, resources, and each other. 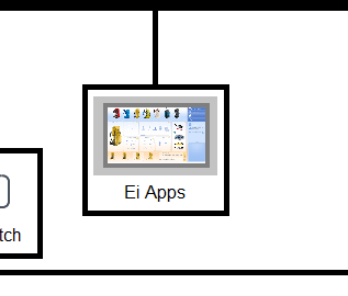 Smart Nodes are the hardware upon which [Ei] OS™ runs. With models ranging from tiny, lightweight, yet powerful playback engines that can be hidden inside kiosks, to incredibly capable compact units that can drive vast interactive video walls and projection spaces, there’s a Node to suit your vision. Fanless units are also available for installing in harsh environments. Couple your Nodes with our range of sensors and controllers to push the boundaries of interaction to heights that will wow your audience. React to anything they do: pick up, touch, walk past, or otherwise engage with your products, then deliver immediate and relevant information directly to them. Trigger salespeople to approach, control any connected device on the Internet of Things when a customer interacts with your products, offer tailored promotions directly to their phone: however you can think to engage with your customers, we can make it happen. [Ei] Nodes™ not only react to their surroundings and trigger actions or play back content, they also give you a window into how your customers use your retail or projection space. Every interaction is logged so you can monitor, analyze and adjust your marketing based on hard data. Link customer interaction to sales, relocate kiosks to maximize exposure, promote products that are selling rapidly, track loyalty points or rewards, all of this and more is possible with [Ei]. Give your environment the ability to think, feel, and analyze, based on the actions of the humans within it. 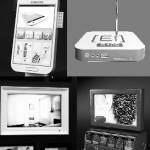 [Ei] Sensors™, scanners, and other interactive devices fit organically into your environment, invisibly collecting data from customer interactions with objects. Create rules of reaction: broadcast advertising content customized to individual viewers, a change in lighting or audio when someone lifts a product, or a sales prompt for an employee. With [Ei] Sensors™ and [Ei] Touch™, your walls, floors, and displays become artificially intelligent, reacting in real time to customer behavior. With over 30 kinds of sensors and ID readers, you can easily and organically integrate intelligence into any type of public space. Convert video walls into interactive tools for customers or employees. Use [Ei] Touch™ technology to empower people to interact with their surroundings, while collecting data about human behavior. Remotely power on, off, or restart multiple devices with [Ei] Switch™. With a smart power outlet, never worry about uptime across regions again. People aren’t impressed with screens. That’s why [Ei] fixtures are custom-built for your analog environment, as an extension of your brand and your identity. 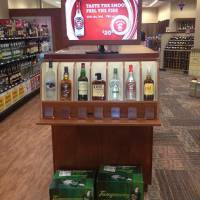 We combine the design of a fixture with cutting-edge technology to deliver interactive product endcaps, intuitive customer kiosks, GIGANTOR product displays, and more. Elevate your public space to an intelligent, exciting destination point featuring smart fixtures with a “wow” factor. The GIGANTOR kiosk provides people with valuable information while taking the shape of whatever you’re selling. The GIGANTOR can be customized to any environment, in any industry. Allow customers to interact naturally with items, while invisibly collecting data about human behavior. Provide an enriching experience with supplementary product information and in-store marketing targeted to that customer’s interests. Empower customers to find their way around your establishment, pay bills, send emails, purchase products and services, and more with intuitive self-service kiosks. [Ei] Apps™ positioning statement here with call to action at end (link). Learn about how the [Ei] Platform is changing the way businesses engage customers and employees. See Tim Ruban, Evogence founder and CEO, demonstrate how the [Ei] Platform creates unique content delivery for customers as they interact with various products. Witness the robust capabilities of [Ei] Publisher™ through this demonstration of the custom-built cocktail builder app for an Evogence retail customer.